The legendary songwriter Alan Menken comes to Chicago for a one-night-only performance at the Auditorium Theatre on Saturday, March 30. In his one-man show A Whole New World of Alan Menken, the creator behind songs like “Under the Sea” (The Little Mermaid ), “Somewhere That’s Green” (Little Shop of Horrors ), “A Whole New World” (Aladdin ), and “Be Our Guest” (Beauty and the Beast ) performs some of these beloved songs and tells stories from throughout his expansive career. Menken was kind enough to take time out of his busy schedule to chat with the Auditorium about his beginnings as a composer, his creative process, and the differences between writing songs for animated films versus live-action movies. Auditorium Theatre (AUD): How did you start your songwriting and composing career? Alan Menken (AM): I often cite watching Fantasia, when it was re-released in 1956, as a pivotal point in my perspective about music. I was 7 years old at the time and already a bit obsessed with the classics, like the symphonies of Beethoven and Tchaikovsky. But experiencing the merging of amazing symphonic music with incredible Disney animation forever changed me. From that point forward, music became indistinguishable from storytelling. And, if you add to that the fact that I grew up in a family that constantly played original cast albums from Broadway shows or sang show tunes and standards, it was inevitable that my love of music would seek out lyrics to feel complete. AUD: When did you know that you wanted to write music for a living? AM: As soon as I realized that there was literally nothing else that could supersede my desire to compose music, I dreaded the idea of making my living doing anything that would take me away from that. Consequently, I determined that I would rather starve than compromise what was clearly my destiny. I thought of composing as a calling, like the priesthood or embarking on some noble quest. Very romantic notion, I know. But, for me, that’s the only way I could take my chosen journey. AUD: Do you find a basic storyline and then build songs around that? AM: There are certain storylines that are most compatible with composing a successful musical or song score. Usually they involve a central character who is not extraordinary, someone most people can identify with easily. And that character needs to have a big “want” and a big obstacle. The stories that involve that kind of character can vary immensely. But the basic structure, the overall arc, is defined by the journey involved in that character dealing with the obstacle. And the moments in that arc that are most emotional allow breaking into song. The emotion might be frustration or hope or anger or joy or despair or celebration. If the song deals with the emotion in a way that pushes story forward, meaning that the song ends in a place distinctly advanced from where it started, then it’s promising. 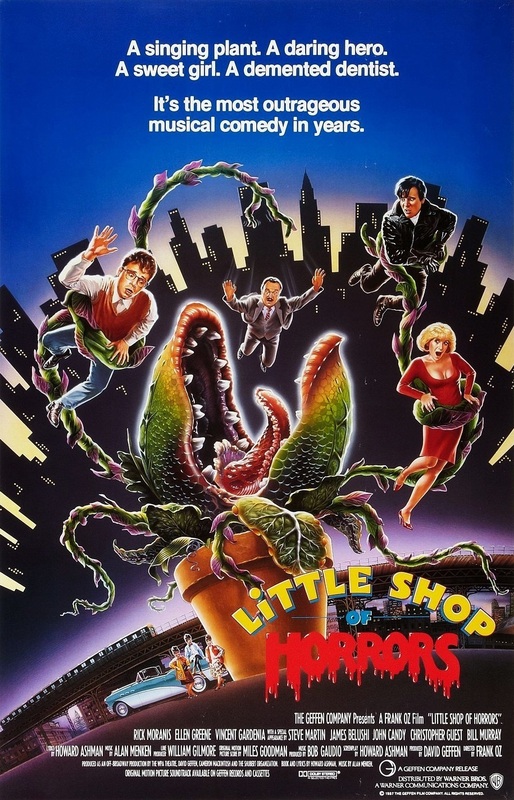 The poster for the movie version of Little Shop of Horrors. AUD: How did you first begin working with Disney? AM: Following our work on Little Shop of Horrors, [lyricist and frequent Menken collaborator] Howard Ashman was recommended to Disney by our producer, David Ge. en, as a writer who knew how to integrate music with drama in an original and compelling way. When presented with a few project possibilities, Howard felt most drawn to Disney Animation, where an adaptation of the Hans Christian Anderson fairy tale The Little Mermaid was being developed. Howard then asked me to come aboard to collaborate on the songs and compose the score. AUD: You’ve written songs performed by iconic characters such as Sebastian from The Little Mermaid, the Genie from Aladdin, and countless others. Is there one character who you feel most connected to? AM: As I often say, they are all my children. How could I favor one over the others? They are all family to me. AUD: Disney has already released a live-action Beauty and the Beast, and there are live-action versions of Aladdin and The Little Mermaid in the works, too. What are some of the biggest differences between writing songs for animated films and creating work for live-action movies or for stage musicals? AM: The differences are slight. And they are generally specific to the medium. Animated films are generally G-rated and family-oriented. Thus, the song content adapts accordingly. The songs need to be accessible, entertaining, catchy, and emotionally involving. Plus, animation is a form that allows for unlimited imagination in action and imagery. Thus, the “fun” quotient is huge. Live-action movies are more grounded in physical reality. So, barring animated or CGI sequences, things are more reality based. The basics of time and place become more of a factor in song choices, affecting musical styles and lyric content. Stage musicals have no close-ups. So, songs become the close-ups. Thus, there are many more song moments usually. In addition, stage musicals generally reach out to a greater percentage of adults, given show times on Broadway. And there is an opportunity to dig a bit deeper into the emotional and textural underpinnings. AUD: Who is your personal favorite musical theatre or film score composer? AM: A few of my favorite musical theatre composers, considered chronologically, would be Irving Berlin, Richard Rodgers, Frank Loesser, Leonard Bernstein, and Stephen Sondheim. Among film composers, a few favorites would be John Williams, Jerry Goldsmith, Alan Silvestri, Randy Newman, and Tom Newman. AUD: Is there anything you’re looking forward to doing when you’re in Chicago/do you have some favorite Chicago spots to visit? AM: I’m embarrassed to say that, other than attending or supporting my own musicals when they open here in Chicago, I have never actually visited the sites. That is clearly something I must amend and soon.